The Philadelphia Phillies have not reached the postseason since 2011 when they lost in the NLDS to the St. Louis Cardinals. Maikel Franco is a big reason why the Phillies have been in contention this year, especially at this point in the season. Make no mistake, the Phillies playoff chances are real. In the last six weeks, no one was really sure what would happen with the Phillies starting third baseman position. Everyone reacts differently to adversity. Some shut down, or give up. Some use it as motivation and perform better than before. Franco seems to be taking it a step further and performing at an elite level. The 25-year-old struggled early on, and it seemed like the Phillies exhausted every option they had trying to find somebody that could play third base. Jesmuel Valentin, Scott Kingery, J.P. Crawford, Pedro Florimon, and Mitch Walding all got a shot to take the starting job. When none of them panned out, it appeared the Phillies would look elsewhere in the league to try and fill the spot. With the deadline approaching, Franco had to know his job was on the line. The 6-foot-1 third baseman had a break out series against the New York Yankees at the end of June. This was just what he needed to get back on track. Although, that shouldn’t come as much of a surprise. In his career against the Yankees, he has 18 plate appearances, 11 RBIs, and his slash line is an impressive .438/.500/1.250. In 2010, he was offered a contract from both the Phillies and the Yankees. Like a lot of young players from the Dominican Republic, he wanted to play for New York. But the Phillies outbid them by five grand and landed Franco. It seems he has used that as motivation every time he plays the Yankees. Getting back to 2018, and even more recently the last month, Franco has 9 home runs, 18 RBIs, and is hitting .321 with a .619 slugging percentage. In comparison, Manny Machado, who many Phillies fans wanted over Franco, has 5 home runs, is batting .330 and has a .590 slugging percentage. Would Machado have helped the Phillies playoff push as the season continues to wind down? Obviously, The Phils would have had to ship a boatload of prospects for a half a year rental. With the third base position being as inconsistent as it’s been, considering a trade for Machado seemed like a smart move. However, Franco has removed any doubts that the Phillies front office may have had over the last month. In fact, he is among a pretty elite list when it comes to home runs and OPS this year. The only other third baseman’s with comparable numbers in those categories are Jose Ramirez, Nolan Arenado, Alex Bregman, Travis Shaw, and Anthony Rendon. 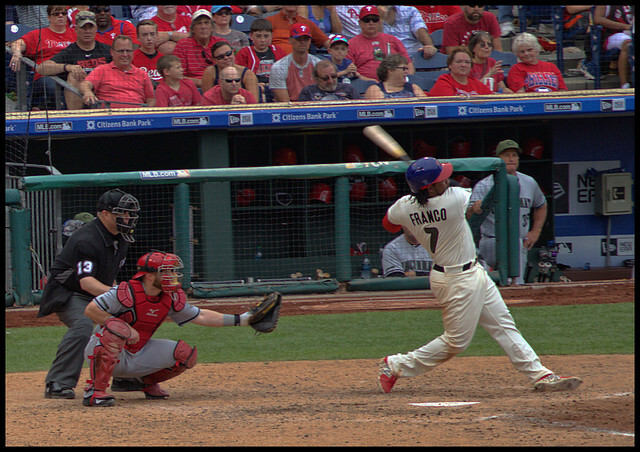 Defensively, Franco is the Phillies best option on the hot corner, hands down. The fact that he has turned his offense around puts him at the top tier of third basemen. At the start of 2018, Maik had little discipline at the plate. The Phillies are currently in first place in the NL East, but to some, its head scratching. As a team, they are batting .238 and for a while, there was no consistency in the lineup. Hoskins has had a major role to play in why the Phillies playoff berth is all but expected at this point. His seven home runs in the last eight games are the most in the major leagues in that time frame. Franco has gotten hot and stayed hot ever since it looked like he was going to lose his starting job and potentially his job in Philadelphia overall. The Phillies have recently added another bat and position player in Asdrubal Cabrera, a switch-hitting veteran who can add power and consistency in the lineup. At any rate, going into the second half of the year is a great time to gain momentum and Franco is a major part as to why the Phillies are still in first place. They need a big second half out of their starting third baseman, and that is just what they’re getting. Story photo is from raymondclarkeimages via Flickr. Featured photo; Bryan Green via Flickr. All statistics in this article are from baseballreference.com. born in Wilmington, DE but I have recently moved into Maryland to be with my girlfriend.